One thing that Alabama head coach Nick Saban is trying to avoid with his team is the thought that all the Tide is doing at this point is playing out the string the rest of the season as some experts like ESPN’s Kirk Herbstreit seem to think. Herbstreit says at this point, the Tide’s biggest opponent is themselves. “I think the biggest challenge for Alabama is going to be the culture that's been created with success,” he said. Bama found itself in this position before in 2010 going into the tough part of the schedule only to lose to South Carolina, LSU and Auburn. Although the schedule is not as tough as it was that year, Bama still has to face Texas A & M, Mississippi State and LSU down the road; not a very easy task. 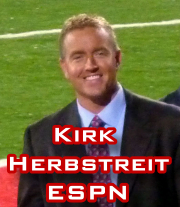 To read more of Herbstreit’s comments check out this link on AL.com.